When it comes weddings, be it the proposal or the planning, the goal is always to do something unique. The newest engagement ring trend in town may seem shocking but many couples are latching onto it—literally. 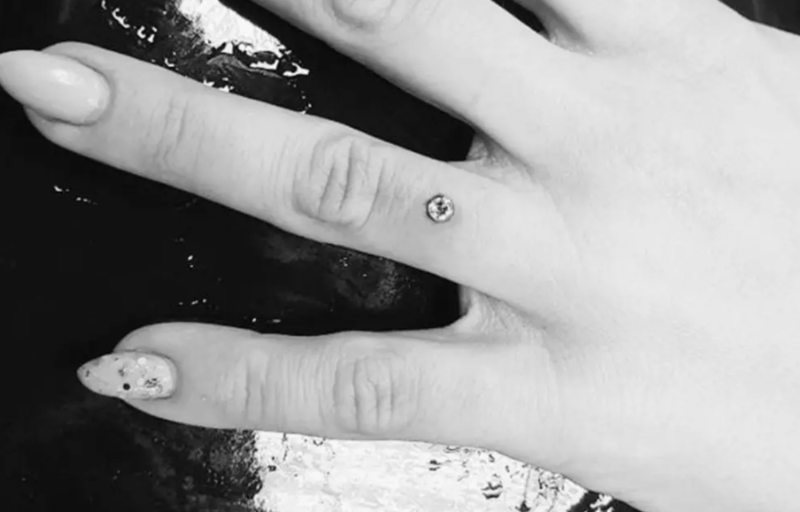 Engagement piercings, as they are becoming widely known on social media, forgo the ring-size struggle by implanting a single diamond (or more) into the skin of the ring finger. The piercing gives the appearance of a bandless or “floating” diamond ring, as the stone is embedded into the finger. To secure the bling in place, a dermal punch is used to remove a small circle of skin. Where the skin is removed, a dermal anchor is inserted and the gem is then attached to the anchor. Many couples also appreciate that the gem top can be interchanged for different sizes, shapes and designs. In case you're wondering whether dermal piercings are safe, some medical professionals have qualms about placing a piercing on the finger, where it can be prone to injury or irritation from daily activities. But dermal piercings have been around for over a decade, and professional body piercers insist that they're safe. As long as they are safely put into ideal places, using implant-grade titanium and sterilised tools, they will not move for years.